FACT: Did you know that more art is now being sold at art fairs than at brick and mortar galleries? Overall, artists are now reporting that nearly half their income is derived from art fairs! Have you had success showing at an art fair? The success of art fairs is an important trend for artists to pay attention to. Art fairs are not going away. But too many artists are still apprehensive about moving in this direction themselves. Over the years, I’ve exhibited at dozens of art fairs myself as an art dealer, I’ve spoken at art fairs and festivals, served as a juror, and I also helped to create a popular Latino art fair. As the founder of The Working Artist Masterclass, I realized that a lot of the artists I work with were interested in participating in art fairs, but felt intimidated by the process. So I’ve spent the past year diving deeper – researching fairs, and speaking with career artists and art fair organizers about the steps for success. What resulted is super-exciting: The Working Artist’s Art Fair Essentials, an on-demand, online course that offers a comprehensive look at art fairs and festivals. Honestly, there’s no other resource like it. 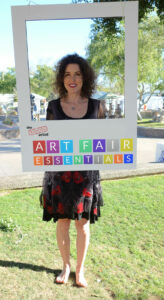 Art Fair Essentials is for artists who are serious about their art and willing to invest the work to get it out there. You’ll feel organized. You’ll save time and money by learning what works and what doesn’t. Click here for more information. And as a special gift for reading to the end, you can use the super-secret code ARTFAIRS to receive $100 off tuition.